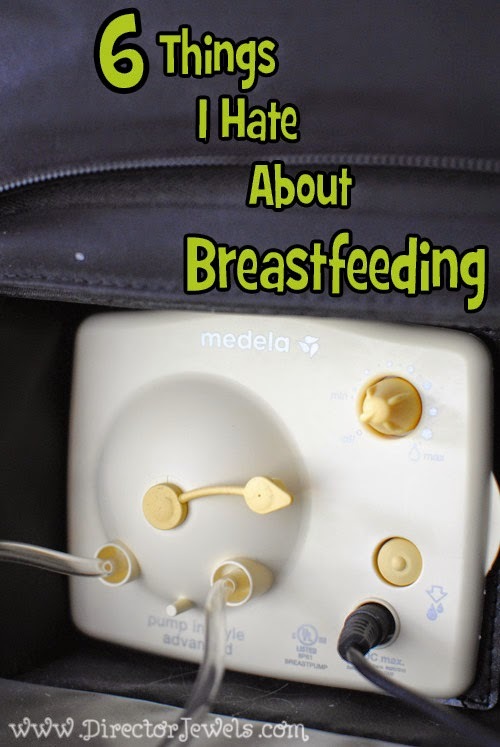 What, you thought I would just tell you 5 Things I Love About Breastfeeding and go on with life without a mention of the not-so-delightful things about nursing? I tell it like it is, friends. I love breastfeeding. Like...I LOVE it. But I'd definitely be lying if I said I had never been annoyed with one thing or another about the breastfeeding journey. So here are the not-so-glorious things! 1. Nursing Hickeys. These tend to happen in the middle of the night when it feels like your eyelids are literally peeling off your face and you just don't care that the baby is hungry again. You get her latched (you think), and collapse back into your dreams of a place where bedtime is 4 o'clock in the afternoon, then wake up in the morning to find a bruise far more alarming than any actual hickey you ever got from kissing. Bright side: at least you don't have to hide this one with a turtleneck! 2. Nursing Covers. I started out loving these things. I had about four. I collected them because they were so cute. Fabric is ridiculously adorable these days, so you can find (or make) a nursing cover to match your nursery or your car seat or your clothing or anything that strikes your fancy. And that's great. But what's not great is trying to get your kid to actually eat under one of these things. This photo is me in the hospital, attempting to latch Lincoln (who didn't know how to latch) in a pile of Boppy and hospital gown and super cute green floral nursing cover. He was less than 24 hours old. Do you know what I wish I had instead? A photo of his sweet little face while he was attempting to nurse in his first day of life. I'm a really really modest person. Honest. I nurse in public constantly, but I do not flaunt anything and I would be surprised if anyone has ever actually caught a full glimpse of skin as my kid latches. I'm not comfortable with people seeing my breasts, so I've learned that there are better ways to nurse without using a tent over your baby's head. When you're nursing a small infant, you really need two hands to do it right. That means you need three hands if you also have to hold the nursing cover out of the way to see what you are doing. Show me a mom with three hands and I'll gift her all these covers I have cluttering up my house. If you want to nurse without a cover, just do it, mama. Let's start a revolution and actually let the newest generation of children think breastfeeding is normal because they see it happen. I don't want my kids to be shamed if they try to peek under a nursing cover to find out what the baby is doing. If they can see the baby, they'll just accept it and go on with life. 3. Gymnurstics. I actually laugh at the antics of a nursing toddler most of the time. But sometimes, you really just want to be able to sit down on the couch and have a soothing moment with your child without her toe up your nose. Be considerate, little person. You certainly throw a big commotion if I try to pry anything out of your snot-crusted face. Mommy knows how to blow her own nose (point Mommy!). 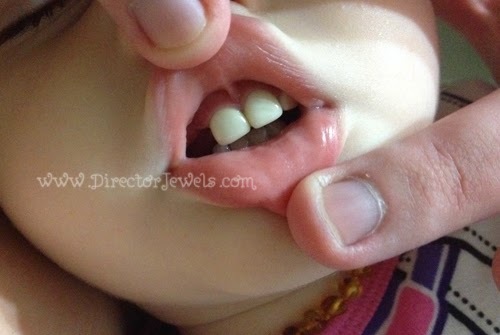 Addie's Early Childhood Caries (tooth decay). 4. Tiny Teeth. When you decide to nurse past six months, you're going to encounter some of these bad boys. I've been pretty lucky - Addie has never been a biter, and Lincoln only thought it was funny for a few weeks. Some babies apparently belly laugh because their mama sounds funny when she screams after their tiny teeth have tried to take a not-so-tiny bite out of her. A baby with sharp little teeth clamping down on your breast is seriously more painful than stepping on 1,000 LEGOs the wrong way. Lincoln is almost weaned. At the end of nursing him, his latch became very lazy and each session was an experiment in how much can I take and tiny indentations in my skin. Not fun. 5. "Are You Stilllllllll Nursing Him/Her?" What, this kid attached to my chest right now? Yup. Still nursing that one. I thankfully don't get this one as often as I expect it. But it annoys me because - really - it doesn't matter if my child is six months or one year or two years or five years old, the decision to nurse him was mine and it was hard and I feel guilty enough about everything else I'm doing as a mom already. I don't need you to give me snarky words about how I'll ruin him for life, because it's proven I won't (at least not by breastfeeding him). This is something I am doing right and when I get nagged about it, it may just provoke me to nurse this kid until college. Take that. 6. Pumping. There is something inherently wrong with strapping a contraption to your body, then being happy as it suctions the life milk out of you. When I quit my part-time out of the home job, I was so done with pumping. And I only worked like 10-15 hours/week. Full-time working mamas and exclusive pumpers, you all have serious dedication and you win all the awesome points of the day. Is it a bad thing that I wrote far more about the things I don't like than I did about the things that I do like? Whoops! What about you? If your kids were breastfed, what was your least favorite thing about it? No judgement!